We have a pair of red-tail hawks that have been hanging around our neck’o the woods again. We think they are planning to nest again, this will be the second time in 3 yrs.DH has been watching them do the mating ritual: circle over the house, then fly into one another and tumble headlong toward earth before pulling apart to fly in opposite directions before resuming the courtship dance all over again. We got a good shot of one 2 summers ago-a Gal Pal of mine named him Rio. He was sitting on top of our T.V. 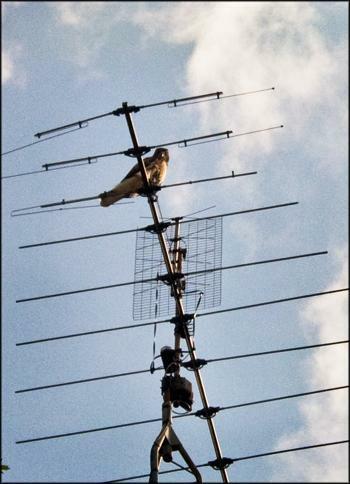 tower, and wasn’t one bit concerned that he had just knocked off one of the tines on the antennae with his bulk. He remained there a good 10 minutes before heading off to find a parent to harass. Seeing him up there, staring down at us, was a bit unnerving, to say the least. Notice the missing tine extension from the right bar, third from top. He had managed to knock that off into a nearby tree. We hope to see a nest started very soon.